For these species, a single individual may produce thousands of seeds, masses of larvae or reproduce from nothing bigger than bits of stems, roots or leaves. Those that live in or near the water – aquatic invasive species – can be easily dispersed to distant water bodies or new ecosystems by currents, tides, river flows, streams, floods and other water flows. 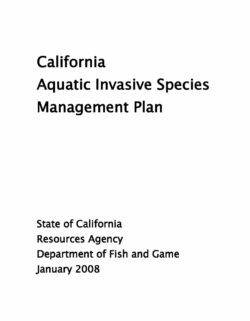 This plan proposes management actions for addressing aquatic invasive species (AIS) threats to the State of California. It focuses on the non-native algae, crabs, clams, fish, plants and other species that continue to invade California’s creeks, wetlands, rivers, bays and coastal waters. State surveys indicate that at least 607 species of aquatic invaders can be found in California’s estuarine waters. These invaders cause major impacts: disrupting agriculture, shipping, water delivery, recreational and commercial fishing; undermining levees, docks and environmental restoration activities; impeding navigation and enjoyment of the state’s waterways; and damaging native habitats and the species that depend on them. As the ease of transporting organisms across the Americas and around the globe has increased, so has the rate of AIS introductions. 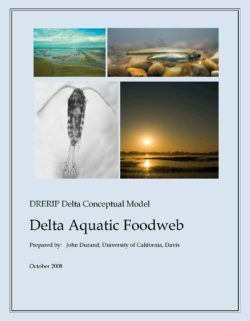 This model is a stylization of the actual food web dynamics of the Sacramento-San Joaquin Delta, which are highly dynamic. The region itself comprises a variety of habitats, determined by salinity regimes, residence time, hydrology, benthos and physical structure. These physical parameters, or drivers, determine species composition and trophic relationships. The Delta is a tidal system which is subject to varying water inflow. Because inflow and outflow vary as the result of anthropogenic alterations and water management needs, habitats are not static. Rather they are subject to hourly, daily, seasonal and inter-annual variation, and different organisms respond in different ways to these time scales, depending upon their own life histories. Thus salinity and temperature regimes may create different outcomes from food web interactions, based upon how species distributional and recruitment patterns overlap. In general, food web linkages are not static or linear. Organisms switch feeding strategies opportunistically, and these patterns of variability in feeding strategy tend to increase with trophic level. Many organisms, particularly plankton, undergo many generations in the course of a year, and selective forces may allow for rapid evolution which can alter habitat preferences or other life history characteristics. The Delta food web is further dynamic in that new species are regularly introduced into the Estuary, competing with, replacing, or preying upon other organisms. For example, the overbite clam, Corbula amurensis, was introduced in 1986, precipitating a cascade of changes that are still not wholly understood. Zebra and quagga mussels are expected to invade the Delta within the next few years, and will bring further changes. The topology of a food web model will be necessarily complex given these factors. Even without such variability, the potential linkages create a spider web of relationships that is difficult if not impossible to disentangle. In order to create a working model of the Delta food web that is useful for education, for hypothesis?generation, and for management decision?making, it is necessary to create limits to what linkages will be examined. In order to do this, this Delta food web model focuses on organisms that supply food for fish. This is particularly important given the recent concern for pelagic organism decline, which is described mostly for fishes, some of which are listed as endangered or threatened. A key assumption is that fish are integrators of ecosystem function. Also included in the model are invasive organisms that have a large impact on food web dynamics (such as C. amurensis), as are organisms that are particularly abundant (such as the copepod Limnoithona tetraspina), whether or not they are used directly by fish. Potamocorbula amurensis is a pest in the San Francisco Estuary (hereafter SFE) due to its ability to heavily graze pelagic food resources and its accumulation of toxic substances that are then moved into the food web through its predators. We begin by describing what we know of its life history and establish its life cycle within the framework of the ecological setting of the SFE. This model should be used within the context of a thought experiment, as there is not enough known about the species to design a strategy to control it in the SFE or Delta. 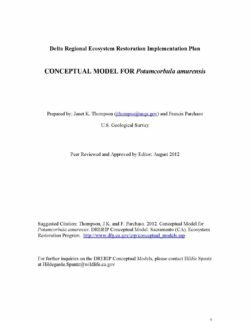 The ultimate purpose of this conceptual model of Potamocorbula amurensis is to explore its weaknesses. The geographic focus of the DRERIP models is the Delta. However we examine the life history patterns of Potamocorbula amurensis as far down bay as San Pablo Bay for two reasons. First, because some of the largest ecosystem effects attributed to P. amurensis are its consumption of pelagic carbon resources, it is necessary to include areas adjacent to the Delta due to the effects of tidal dispersion. Second, many of the life cycle patterns that are visible in San Pablo Bay are transferrable to upstream locations during drought periods. Finally, we expect this model to evolve as a result of the many ongoing studies on P. amurensis. 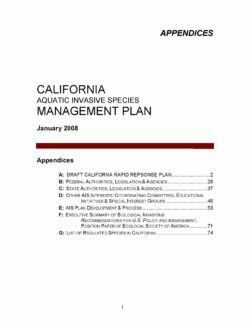 Some of the data shown in this discussion are the direct result of current CALFED studies being done jointly by California Department of Water Resources (EMP Program D. Messer and K. Gerhts) and the USGS (Analysis of Archived Samples to Assess Patterns of Historic Invasive Bivalve Biomass). Our co-investigators on that study have been gracious in allowing us to show some of that data here, before it has been published. We start the model discussion with a brief description of the taxonomic status of this bivalve because the utility of the literature available to us is based on assumptions of the correct identification. We also very briefly describe its introduction into the SFE as a reminder of the facts about its invasion. This paper reviews recent research findings on food web processes since 2008. It also highlights the idea of a changing baseline with respect to food web function. New research indicates that interactions between habitat-specific food webs vary across the current landscape. For example, based on early work in the south Delta, the food web associated with underwater vegetation was thought to provide little support to species of concern; however, data from other regions of the estuary suggest that this conceptual model may not apply across the entire region. Habitat restoration has been proposed as a method of re-establishing historic food web processes to support species of concern. Benefits are likely for species that directly access such restored habitats, but are less clear for pelagic species. 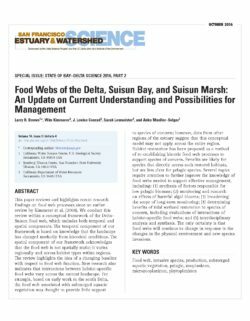 Several issues require attention to further improve the knowledge of food webs needed to support effective management, including: (1) synthesis of factors responsible for low pelagic biomass; (2) monitoring and research on effects of harmful algal blooms; (3) broadening the scope of long-term monitoring; (4) determining benefits of tidal wetland restoration to species of concern, including evaluations of interactions of habitat-specific food webs; and (5) interdisciplinary analysis and synthesis. The only certainty is that food webs will continue to change in response to the changes in the physical environment and new species invasions. In the United States, numerous federal and interagency efforts share responsibilities regarding invasive species. Among the federal agencies involved are the Departments of Agriculture, Commerce, Defense, Homeland Security, Interior, Transportation, and others, including the Environmental Protection Agency and the Executive Office of the President. Of these, three Departments—Agriculture, Commerce, and Interior—play a major role by co-chairing the National Invasive Species Council (NISC). Created by Executive Order 13112 in 1999, NISC provides high-level interdepartmental coordination of federal invasive species actions and works with other federal and nonfederal groups to address invasive species issues at the national level. In FY2016, the U.S. government spent an estimated $2.3 billion across a range of federal agencies and activities in an effort to prevent, control, and eradicate invasive species domestically. Activities at the Department of Agriculture accounted for the bulk of available federal funding, nearly $1.2 billion (53% of total available funds). Activities at the Department of Homeland Security, comprised of mostly border protection and security activities, accounted for about $0.8 billion (33% of total funding). The remainder of federal funding, about $0.3 billion (about 14% of total funding) covers activities across a range of agencies at the Departments of Interior, Commerce, and Defense, and other independent agencies. 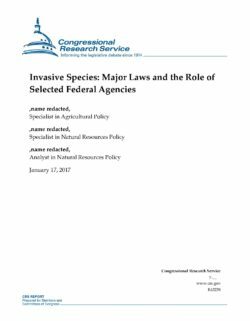 Despite efforts to achieve high-level interdepartmental coordination, comprehensive legislation on the treatment of invasive species has never been enacted, and no single law provides coordination among federal agencies. Instead, the current legal framework is largely governed by a patchwork of laws, regulations, policies, and programs. Some laws are tailored to individual species or narrowly focused on what is affected by the species. Other laws have a broader intended purpose and may only peripherally address invasive species. Some laws, although they do not directly address invasive species control or prevention, may limit such introductions.